Pool, beach, eat, drink, repeat. That’s basically my entire Holiday weekend in a nutshell. Oh plus a rousing game of bocce ball (which I lost, btw), a night of fireworks and general silliness with good friends. Overall, I have no complaints. Except that I want to be doing it all over again. Today we’re talking about one of my favorite summer staples: pesto. But this is no ordinary pesto. Because there isn’t a single basil leaf within a 50 mile radius (= exaggeration) of this sauce. That’s right. No basil plants were harmed in the making of this pesto. Instead, I’m whirling up some freshly shelled peas (trust me, it’s worth the time it takes to shell them) and some peppery arugula. And I’m skipping out on the Parmesan cheese to keep this Pea and Arugula Pesto completely dairy free. Trust me. You won’t even miss the cheese. So what can you do with this Pea and Arugula Pesto? Um…how about everything and anything (= exaggeration #2). 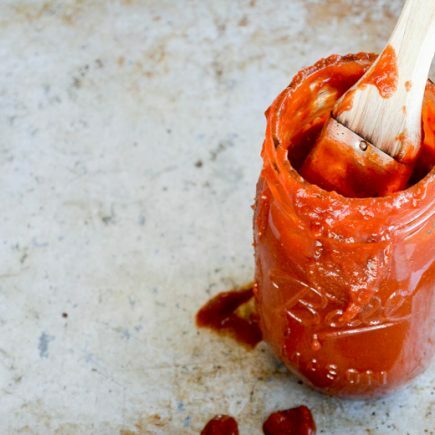 Toss it with pasta, use it as a sandwich spread, slather it on grilled meats and veggies, or top some little toasts for an easy appetizer (just like I did in the photographs). The possibilities are fairly endless. Since it’s the start of a new month, we’ve got other seasonal ingredients (in addition to peas and arugula!) to take into consideration while we shop, cook and eat our way through July. 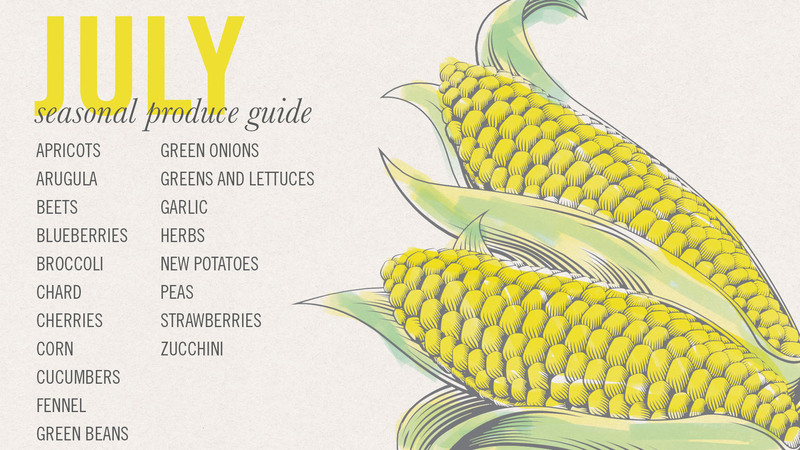 So have a peak at Becky’s seasonal produce guide for this month. And better yet, save it to your phone or tablet so you can have it at the ready when you hit the grocery store. 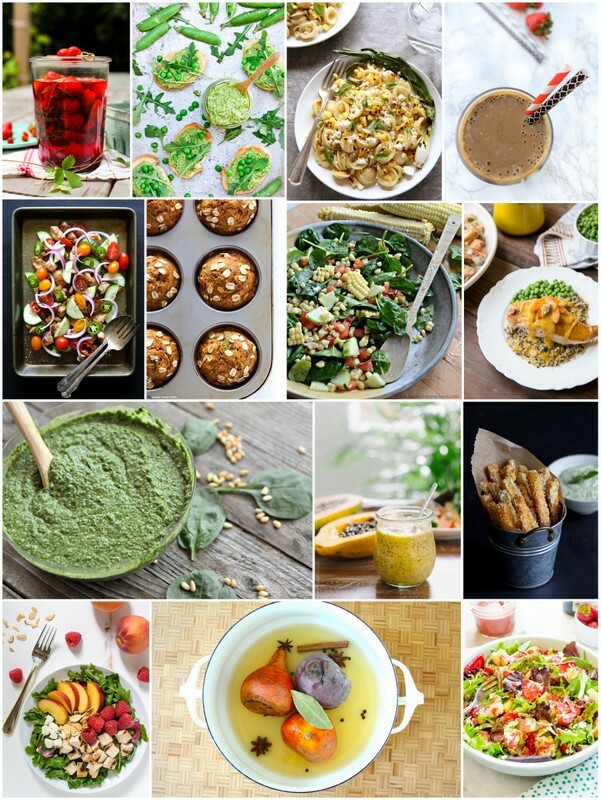 And if you need some recipe suggestions for all of July’s awesome fruits and vegetables, check out what some of your other favorite food bloggers have created for this month by clicking on the links below. 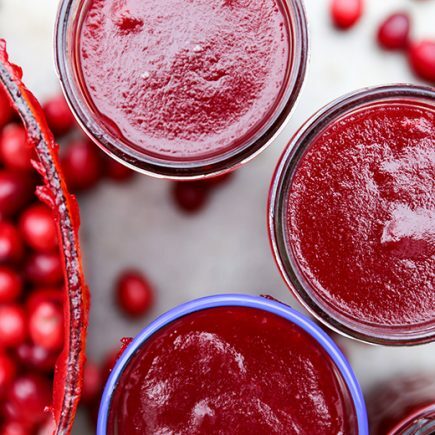 And make sure to follow along with the hashtag #eatseasonal (and share what you’re making in your kitchen too! ), for even more inspiration and ideas! In a dry skillet over medium-high heat, lightly toast the walnuts until they are just starting to become fragrant, about 1-2 minutes. Remove from the heat and set aside to cool slightly. In the bowl of your food processor with the blade attachment, blend together the toasted walnuts, garlic, peas, arugula, mint, lemon juice, salt and black pepper until finely chopped, scrapping down the sides of your food processor as necessary. Then with the food processor running, gradually stream in the olive oil, blending until everything is well combined. Transfer the pesto to a small seal-able container and refrigerate it until you’re ready to use it. While pesto is best used when it’s fresh, it can be stored in your refrigerator for several days. 1. If you are using frozen peas, thaw them before using. If you are using freshly shelled peas, blanch them in boiling water for about 1 minute, drain and then let them cool before transferring them to your food processor. Pesto is definitely a summer staple for me, too! I love this kind, Liz! Such a great idea to forgo the basil and add in peas and arugula. This looks so delish and your pictures are just stunning! Pesto is just SO GOSH DARN GOOD! Love it on everything. Thanks for the great compliment, Gayle! My hubby had to work all weekend. Which means I went to bed at 8 30 on July 4th and spent the day baking. Alone. I LOVE pesto, and this pea and arugula creation is calling my taste buds! pinned! Oh boo! Well, hopefully you at least celebrated Canada day? Thanks, Medha! Glad you love it! Oh yeah, I ate some fried food too. And lots of ice cream! Such a fun weekend, Liz! General silliness…. yes!! Me tooooo!! Lots of hiking at Mt. Baker, slow mornings, weed pulling and cherry pie for me! Yeeee! It was a good one! I just got bags and bags of various peas at the market this weekend and was thinking of Pea Pesto… but I didn’t think of pairing it with arugula! This sounds just fabulous Liz… I love the vibrancy of pesto, especially pea pesto! Slather it on everything… I like it! Your weekend sounds lovely, Traci! I hope you try out the pesto! I love pesto in every way, shape, and form. This combination sounds delicious, Liz, and I could totally eat it with a spoon! Oh my, that green is just so VIBRANT! Thanks, Nicole! I need lots of green to make up for what I ate over the weekend! HA! Sounds like such a lovely weekend! I love playing bocce ball but my team basically never wins. I always blame it on the fact that the game is typically paired with booze 😉 Loving this pea and arugula pesto! I can taste the flavors now! Ha ha – there was definitely booze. And then I wanted to change the rules too – like we should have to chug a beer, spin around a baseball bat and then throw the balls. That would be more fun! LOVE this idea Liz!! I think it would be especially good on a sandwich but I’d probably even eat it by the spoonful. So glad you had a good holiday weekend with your dear friends. Thanks, Becky! I definitely ate some of it by the spoonful! Sounds like an awesome weekend to me Liz! I love pesto and this one sounds so different I have to try it! Little pieces of toasted baguette, some of this pesto and maybe a nice fresh strip of roasted red pepper! Yummo! I super duper love this! I just so happen to have peas and arugula in my garden! This will be the perfect way to use them up. Love! This is seriously really stunning! Gorgeous! Liz, pesto is most definitely one of my favorite summer staples. . and I LOVE the pea and arugula combo!!! Gorgeous! Thanks, Alice! I hope you try it out! Eating seasonal is my favorite. This pesto is perfection and I would gobble up every one of those toasts! Hope you get some pool weather soon, Amy! I need to get me a pool, but first I need to get me a house with a bigger yard that will actually fit a pool. I’m seriously jealous over your summer list you mentioned above. It sounds like a good deal. Love this pesto. You are welcome over anytime! It’s so great on sandwiches! I hope you try it out, Jennifer!